What’s wrong with this picture? I crash a stylish party at a pricey venue (SF Moma). I have no business being there, nor do I have the required invitation. I nonchalantly talk my way in, and hit the crowd with two fellow geeks. Within a few seconds an attractive blonde with a low cut dress approaches us and engages us in a conversation. We grab a few free drinks, indulge on the tirelessly circulating horse d’oeuvres, and talk to the blonde. What’s wrong with this picture? That we are a bunch of geeks with no social skills and nothing to talk about the last mashup we built. This kind of stuff happens only in my dreams or in the 1999 dot-com bubble years. Strangely, though, it also happened last night at the MySpace Party. Accompanied by fellow geeks John Musser and Richard MacManus, I crashed the party and (not very successfully) tried to blend into the mass of beautiful people. In my frantic attempts to socialize, I did meet Jyri Engeström, Jaiku co-founder and now fellow Googler. According to his micro-blog, he just found a house in the Mission and is turning 30. Congrats! We also exchanged a few words with Oren from Mashery, who staged the Business of APIs conference earlier in the week. 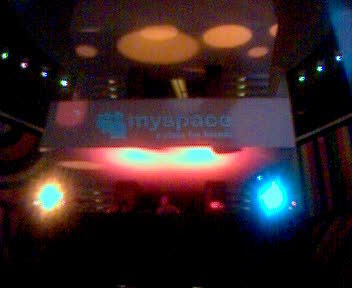 People were expecting MySpace to make a big announcement, but it ended up just being a see-and-be-seen event. Earlier that evening, Chris DeWolfe announced that MySpace is going to come out with some platform play some time in the future. As if we could not have guessed. I did not attend the actual Web 2.0 (TM) Summit, partly because I did not want to pay $3000, partly because I missed the registration (apparently it sold out in a week), and partly because it’s meant for people who are more important than I am. Programmable John (who got a press pass) lamented that the hallway discussions were not all that interesting, most likely because attendees are looking for investment opportunities and do not like to share their insights. Gregor’s will-they-let-a-geek-like-me-into-a-hip-party meter indicates that Silicon Valley is pumping once again at full pace. A lot of my friends recently received funding or are starting new companies. The parties are more extravagant and easier to get into. Rent is up. Waiters are getting cockier. Will it be another bubble? I think there is a lot of opportunity in Web 2.0 (or whatever we want to call it), but things are a bit more sane this time than last. For example, I don’t think my grandma is going to invest her life savings again in some fly-by-night dot com. I also feel better about how these companies are using the Web. It seems that the new breed of applications consists of true Web applications, the ones that would not be possible without Internet technology. Last time around, people seemed most interested in teleporting traditional revenue models onto the Internet (I got my sock puppet). This generation of Internet applications exploits the inherent network effect of the Internet, combined with user’s ability to contribute information to the network. By now, it’s also proven that advertising-funded revenue models are working.